I hope you are having a wonderful weekend. It is not over yet, enjoy! I was planning to blog yesterday night but right after having dinner, I came up with the idea of visiting our favorite cocktail place to have a drink or two. There is a great jazz lounge with live music and cocktails are so yummy. I started with my favorite, Mojito and moved on to Mai Tai which I also like. But then there were Japanese crab crackers which came with the cocktails, don't ask me how these combine but I am known to go overboard with everything which is coming from Japan so the salt in there made me drink the Mojito in a record speed. Rest is history... I must have slept before midnight lol. On the 1st of November the first holiday collection of Suqqu will be released. Suqqu is planning more releases this season, there are store exclusives and some good value kits but the wide spread Holiday release of this year consists of two kits. Each kit has a pouch, a limited Eye Color Palette (trios) and a limited Gel Eyeliner Pencil as well as a two phase Eye Makeup Remover. Due to shipping restrictions I won't be able to show you the make-up remover but I am excited to share my thoughts on Makeup Kit A today featuring Suqqu Eye Color Palette Ex-03 Aosaori and Gel Eyeliner Pencil Ex-02. I will also review Makeup Kit B soon. Suqqu Holiday Makeup Collection is inspired by garments we wear during Holiday season. The Eye Color Palette patterns and the pouch is matching and reminding me of wool knit fabric and tweed. I find this year's pouches very pretty. I can see myself using it as make-up bag during my travels. In fact the Eye Color Palette's name, Aosaori is after a special garment, Ao is blue and Saori is a painterly hand-weaving that emphasizes improvisation and creative expression. You can read more about it here. Top: A light neutral gold with shimmery finish. The shimmer is Suqqu specific soft shimmer which never appears frosty nor too strong. This makes it wearable for mature eye lids as well, a strength of Suqqu textures. This particular shade is one of the most shimmery I have seen from Suqqu to date but it doesn't appear garish nor too much. That said a small remark, this shade produces fall out during application so I advice you to apply the eye shadow first and foundation later. It is the one and only shade which I experienced to have fall-out from the brand. Middle: A neutral to cool taupe bronze with satin to shimmery finish which is to die for. On a rush just apply a wash of this color all around the lid for a polished look. It appear to be soft on my swatches but it shows up really well on my eye lids. Bottom: A beautiful mix of blue and bronze. The mixed pattern is not only an over spray but the deeper layers have the mixture as well. The blue is really intense and very pretty. It applies like a dream. Suqqu is one of the brands which can do the blue. It is no joke that it is hard to find blue eye shadow which is not dry and doesn't perform fall out by many high-end brands. This one has very pretty neutral undertones and it performs like a dream. All layered together, Suqqu Eye Color Palette Ex-03 Aosaori reveals a neutral old gold/khaki shade with shimmery finish which is super pretty. 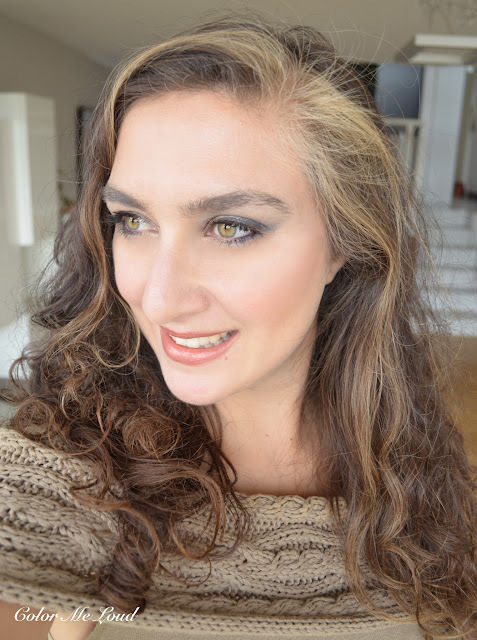 Here is the first eye look I tried and loved wearing it yesterday to the lounge while sipping my Mojito. It is a very classical replacement with gold on the inner corner, taupe (middle shade) all over the lid and blue as an outer corner and crease definition shade. I am also wearing Gel Eyeliner Ex-02 which is a black/blue with blue shimmer. Gel Eyeliner comes with both of the kits, I have a swatch of that at the end of this post. The liner and the eye shadows go so well together. 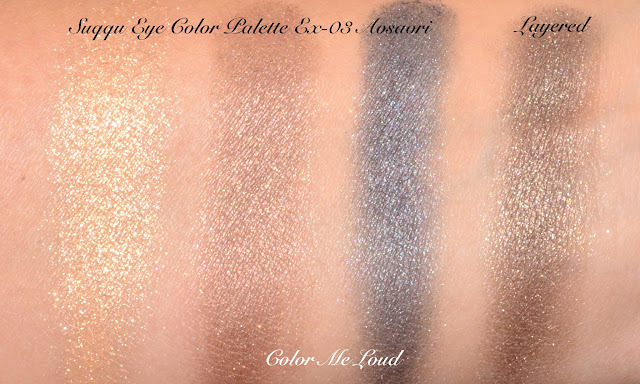 Here is another Suqqu Eye Color Palette Ex-03 Aosaori eye look with more gold and blue, less bronze/taupe. I applied the bronze/taupe to the inner third, gold in the middle and blue on the outer third. I completed this look again with the Gel Eyeliner Ex-02. As you see since I blended blue with gold, it appears more green. Aosaori have many shade combinations. 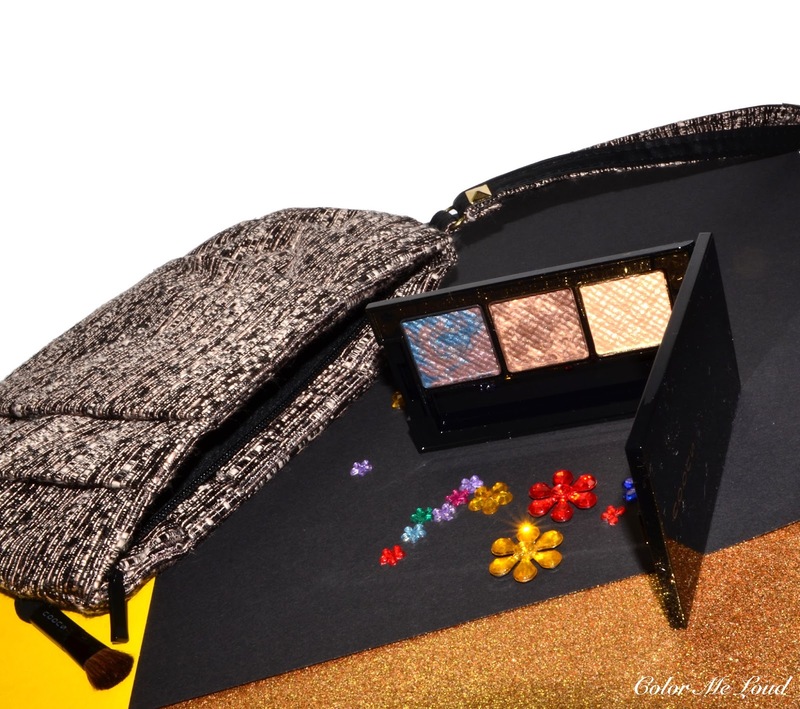 Here is the golden look in context with Suqqu Eye Color Palette Ex-03 Aosaori and Gel Eyeliner Ex-02 on the eyes . I combined it with Chanel Joues Contraste Alezane on the cheeks (reviewed here) and Chanel Rouge Coco Shine Mélancolie on the lips (more about that one soon). I also picked a matching khaki top with knit wool fabric. Here is a swatch of the Suqqu Gel Eyeliner Ex-02 with black/very deep navy base and blue shimmer which only becomes apparent if it catches the light. The liner is really pretty and it lasts all day without budging and fading. I got myself the brown liner (reviewed here) after trying out the bordeaux one from the Fall Collection (reviewed here). I am in love with these. 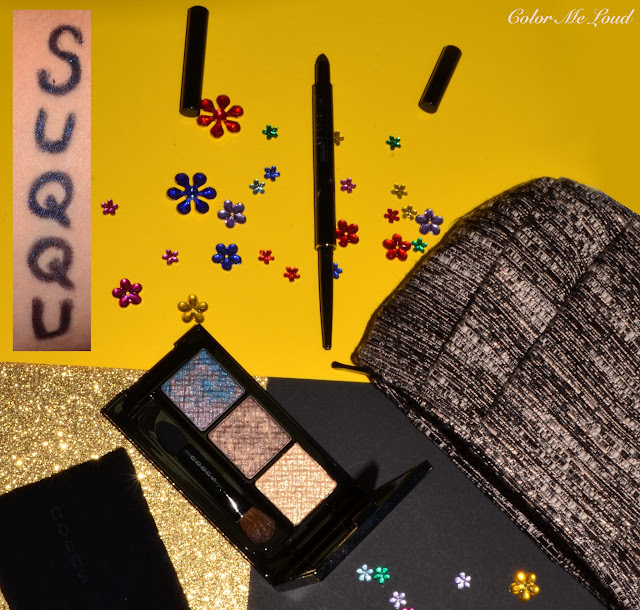 Final thoughts: For fans of Suqqu's soft shimmer and dreamy textures as well as many layering possibilities, Suqqu Makeup Kit A is a lovely option to put under the Xmas tree from yourself to yourself or from a loved one alike. The eye trio and the liner make a great combination and the pouches of this year are very cute. Availability/Price: This year's Holiday Kits launch at Selfridges on the 1st of November. They cost £48, which is less than last year's kits (£58) which had an Eye Shadow Quad (Last year's Kit B is reviewed here). Considering that the trios retail for £35 and Gel Eyeliners are £20, together with the pouch and makeup remover, holiday kits are of good value. Suqqu is available on store at Fenwick of Bond Street, Harrods and Selfridges and online at Selfridges and Harrods. I hope there won't be any restrictions due to make-up remover by the international shipping of these kits from UK. Do you like value holiday sets for the season or do you prefer buying single items ? Disclaimer: The products in this post were sent for my consideration. LOL yes this one is so pretty. You have to see the shimmer too, it is very hard to capture with the camera. Shipping restrictions because of that freaking makeup remover...that's too bad and stupid too be true, but in less than two weeks we will find it out. Very qute and very wearable trio. Thanks for the swatches, look, and the info! Very pretty and I love your photos of this. That sounds like an excellent Saturday night!! This is very beautiful on you. 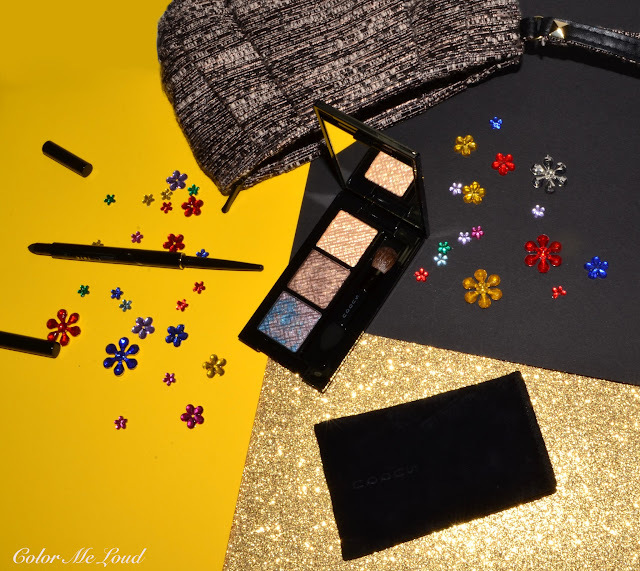 Something about those suqqu colours + your colouring = gorgeous! This palette is simply gorgeous - I have to admit that brown and blue is one of my favorite color combination for the eyes, but even if it wasn't, the way it glows is dreamy! Oh wow.... i really love the tweed inspiration in the pouch, and even the weave of the design on the palette looks very tweed-ish to me. I wished it looked more like Japanese silk, but in any case, the effect on your eyes is stunning! thanks for your remark. I will do that whenever I can. I added a few photos here and there with two swatches after I read your comment. Sometimes I can't though because it is hard to catch the daylight during this season and I need to rely on studio lighting. Hi Linda, it seems there is a tweedish Japanese fabric, the one I linked above. I was also surprised. I love this trio, thanks for your lovely comment. Yay to report that these were available without any restrictions phew! You should, not all the eye shadow formulas can be layered. You don't have to necessarily layer them but that means they also blend perfectly since the transition shade can be seen as layered. I love their trios too. Blue is a hard to get right color and Suqqu does it so well. Did you end up getting one of these? Both of the sets are nice, I love this one a bit more but you are cool toned so the other one might be better on you. Hi Eleni, did you end up getting it? To me it is also one of the most interesting color combinations this season.